Cadillac's European retail schemes could be adapted for U.S.
A rendering of the “experience center” Porsche will open in Los Angeles; Atlanta will get one, too. DETROIT --After a string of failed efforts, Cadillac is again pursuing a toehold in Europe. But this time it's approaching the world's most competitive luxury market with more humble ambitions -- and a new retail strategy that, if successful, could be transplanted to its home market as well. Rather than expanding its meager dealership network of about 40 stores, Cadillac plans to open several test-drive centers, stand-alone service facilities and pop-up storefronts across western Europe. The idea is to expose prospective customers to Cadillac products without forcing them to visit a dealership, which is "not really what they want to do given how limited their leisure time is," says Uwe Ellinghaus, Cadillac's global chief marketing officer. He said elements of the retail model "clearly" could be adapted for the U.S. market. "I think the future of retail in the automotive industry is without bricks and mortar, at least compared to what we do now, which is invest multimillions in dealerships," Ellinghaus said. That would give Cadillac the ability to "control not only the transaction prices better, but also the quality of the experience, of the dealer touch points," he said at the Geneva auto show earlier this month. Other luxury automakers are rolling out alternative retail strategies in the United States as they adapt to shifting shopping habits, offering customers the chance to kick tires in an environment free of sales pressure or financing pitches. Test tracks, virtual showrooms and other automaker-operated spaces offer car companies a chance for the sort of direct customer face time that has mainly been the dealers' domain. Ellinghaus: A global approach to luxury-brand customers. Porsche plans to open "experience centers" in Los Angeles and at its new headquarters in Atlanta, where owners and prospects can tear around test tracks and learn to tell their Caymans from their Cayennes. BMW's new retail sales model includes plans for regional pools of test cars with a wider range of models, giving dealers access to more demo models than any store could stock. The brands are careful to say that the facilities are intended to supplement, and not supplant, the dealership experience, and that their dealer networks remain the bedrock of their retail strategy. None of the automakers say they're looking to replicate Tesla Motors' factory store model. But it remains unclear just how the dealership's role fits into these retail setups. 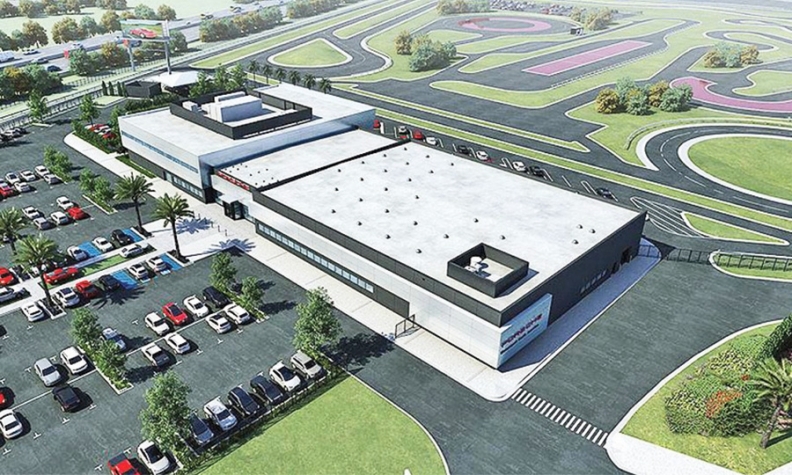 Doug McIntyre, general manager at Jim Ellis Porsche in Atlanta, says the new Porsche test center, a 30-minute drive from his store, should generate buzz and business. Still, he's unsure how sales prospects will be handled. "I think they'll refer sales to the dealerships," McIntyre says. "Then again, you never know. Car companies are getting bolder and bolder all the time." Porsche's experience centers and Cadillac's plans for Europe point to a nascent trend in automotive retailing, according to a McKinsey & Co. study released last month. The consulting firm identified several new retail formats that "will cover specific parts of the customer-decision journey that had previously been the task of the traditional dealerships." They include test-drive centers, online showrooms, pop-up locations, city stores and "super stores," defined as large metro facilities with extensive lineups of vehicles that buyers could purchase "on the spot without any delivery time." McKinsey says the new retail elements complement traditional dealerships while potentially making stores less costly to operate -- reducing floor plan costs by having test drives done off site, for example. Still, the study suggests a splintering role for dealerships in the future, where all but the largest groups will have to specialize in certain aspects of retailing. "Dealerships as retail formats will not vanish," the study says. But dealers "will have to decide which part of the customer decision and experience journey they want to focus on: brand awareness building and messaging, product experience, sales transaction, parts and service." Hans-Werner Kaas, who leads McKinsey's Americas automotive practice in Detroit, told Automotive News Europe sister publication Automotive News last month that several of the alternative formats already are being used in Europe, although some of the approaches might not be compatible with various U.S. dealer franchise laws. Ellinghaus said Cadillac's weak sales in western Europe -- fewer than 400 units last year -- makes the market ripe for experimentation, with the goal of transplanting successful aspects to other markets, including the United States. Said Ellinghaus: "Global premium brands have cosmopolitan customers who want the same products, the same communication campaigns and the same dealership treatment the world over."